Berliners – hell, all Germans – complain about the inefficiency and unreliability of the subways and trains, but it's a sure sign that things are improving when other cities around the world start to do what Berlin has been doing for years. 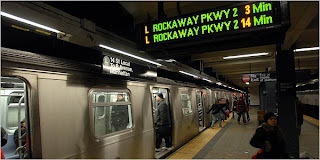 New York is now testing a system of electronic signs in the subways that tell passengers how many minutes they will have to wait for the next train. Of course, most Berlin subway lines and even a lot of bus stops have had such a system for years now (and it's great). In a story about it, the New York Times wrote with surprise that the new systems seemed "as foreign to the subway as a man offering a woman a seat on a crowded train. On this day, however, the signs worked like a charm. A stopwatch revealed that the trains came and went as predicted. It was almost unnerving."